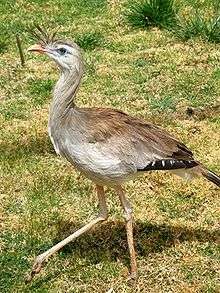 Cariamiformes (or Cariamae) is an order of primarily flightless birds that has existed for over 60 million years. The group includes the family Cariamidae (seriemas) and the extinct families Phorusrhacidae, Bathornithidae, Idiornithidae and Ameghinornithidae. Though traditionally considered as a suborder of Gruiformes, both morphological and genetic studies show that they belong to a separate group of birds, Australaves, whose other living members are Falconidae, Psittaciformes and Passeriformes. This proposal has been confirmed by a 2014 study of whole genomes of 48 representative bird species. This analysis shows that the Cariamiformes are basal among extant Australaves, while falcons are next most basal; in combination with the fact that the two most basal branches of Afroaves (New World vultures plus Accipitriformes, and owls) are also predatory, it is inferred that the common ancestor of 'core landbirds' (Telluraves) was an apex predator. However, some researchers like Darren Naish feel that this assessment is biased towards the more well known, predatory representatives of the clade, and indeed at least one form, Strigogyps, appears to have been herbivorous. The earliest known fossil belonging to this group is an isolated femur from the Cape Lamb Member of the Lopez de Bertodano Formation, Vega Island, Antarctica. This specimen, which dates to the late Cretaceous period 66 million years ago, is indistinguishable from the femurs of modern seriemas, and belonged to a large bird about 1 metre (3.3 ft) tall. Because of its age and geographic location, this unnamed species may have been close to the ancestry of both cariamids and phorusrhacids. ↑ Alvarenga, H., Chiappe, L. & Bertelli, S. 2011. Phorusrhacids: the terror birds. In Dyke, G. & Kaiser, G. (eds) Living Dinosaurs: the Evolutionary History of Modern Birds. John Wiley & Sons (Chichester, UK), pp. 187-208. ↑ Hackett, Shannon J.; et al. (2008-06-27). "A Phylogenomic Study of Birds Reveals Their Evolutionary History". Science. 320 (5884): 1763–1768. doi:10.1126/science.1157704. PMID 18583609. Retrieved 2008-10-18. 1 2 Jarvis, E. D.; Mirarab, S.; Aberer, A. J.; Li, B.; Houde, P.; Li, C.; Ho, S. Y. W.; Faircloth, B. C.; Nabholz, B.; Howard, J. T.; Suh, A.; Weber, C. C.; Da Fonseca, R. R.; Li, J.; Zhang, F.; Li, H.; Zhou, L.; Narula, N.; Liu, L.; Ganapathy, G.; Boussau, B.; Bayzid, M. S.; Zavidovych, V.; Subramanian, S.; Gabaldon, T.; Capella-Gutierrez, S.; Huerta-Cepas, J.; Rekepalli, B.; Munch, K.; et al. (2014). "Whole-genome analyses resolve early branches in the tree of life of modern birds" (PDF). Science. 346 (6215): 1320–1331. doi:10.1126/science.1253451. PMC 4405904 . PMID 25504713. ↑ Case, J.; Reguero, M.; Martin, J.; Cordes-Person, A. (2006). "A cursorial bird from the Maastrictian of Antarctica". Journal of Vertebrate Paleontology, Supplement to. 26 (3): 48A.